Are you still stuck with the classic black or brown color office chairs? Well it’s time to add style to your office with color in your office chairs to make work fun and your office instantly stand out. The HOF Molto has a striking presence with PU leather upholstery in royal red color that gives it authority and power. The premium high back chair comes with S- curved back, rich stitch detailing and 40 DC super soft foam including advanced ergonomics. The sophisticated luxury styling and tufted pattern with glossy veneer finish adds a regal touch to your office. As one of our bestseller, the HOF Lyon 601 N stands out for its advanced ergonomics and electric blue color that is the perfect pop-of-a color to style your office or your child’s study room. The award-winning chair effortlessly blends design, style and value to brighten your workspace ambiance. The HOF Marco 1008 M comes in a variety of classic colors in an eclectic mix that adds a modern touch to your workspace. It also features a specially designed chrome sigma base, variety of ergonomic adjustments including 4-way adjustable mechanized head-rest and 4-way lumbar support for better posture and comfort. It makes a great choice to jazz up your office or corner office. Forget about a boring workspace with black office chairs! The stylish, modern HOF Newton in striking red color adds style and look with its S-curved back and adjustable ergonomic features. Mesh-back with great lumbar support makes it versatile for the modern office. 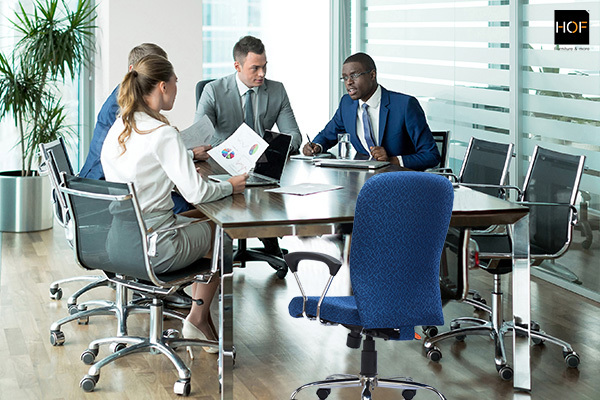 HOF – one of India’s leading office chairs suppliers offers you their stunning range of office chairs online in wide range of colors and upholstery. Hurry and shop online now to get upto 50% off on select chairs in the HOF Year End Sale. « How To Choose A Leather Office chair?